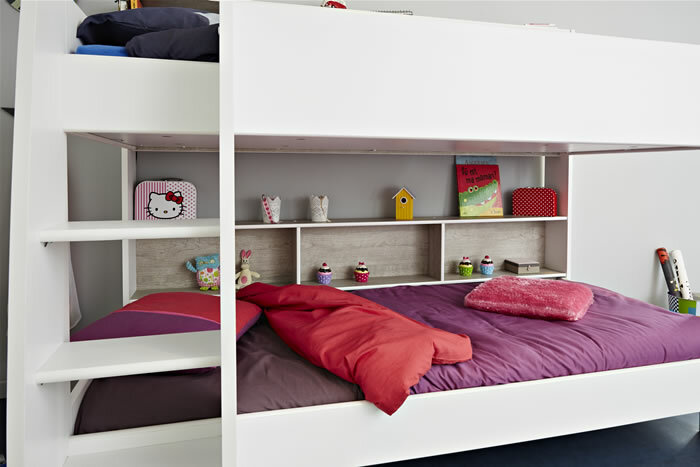 The Kids Avenue Tam Tam 3 white and loft grey bunk bed features a sturdy step ladder with 3 deep steps and bedside shelving for each bunk. For additional strength and comfort the top and bottom bunk mattress bases are solid boards instead of basic slats. For bedside storage the Tam Tam 3 bunk bed offers a modern shelving design with 3 open front sections for each bunk with a full width shelf above. An optional under-bed storage drawer is available, please note the Tam Tam under-bed drawer is only suitable for storage use, it is not a trundle drawer for sleeping in.